I have spent the week chained to the computer. I am about halfway done with the handout for the finishing course. It is shaping up quite nicely. It has tons of photographs in it which will make it much more useful to the attendees but a pain to write. Registration is now closed. I'm asking the students to bring a binder and page protectors. They will have a very complete reference guide to take home. 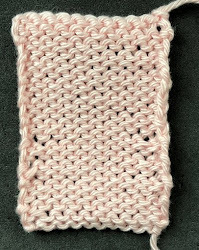 I decided to knit the swatches for the examples with size 11 needles so that the stitches are very visible. I think this is very brave of me as it is REALLY hard to knit with decent tension on needles that size. I had lots of lessons to review this week which is great. Keep them coming! For those of you working on Lesson 3 and who want to do the extra credit, I can send you the pattern template we use for the Masters Program. It is much easier to write a pattern when you have a specific format to follow. Just let me know if you want the template and I can send you the link. This is the last tip about how to measure and calculate gauge. 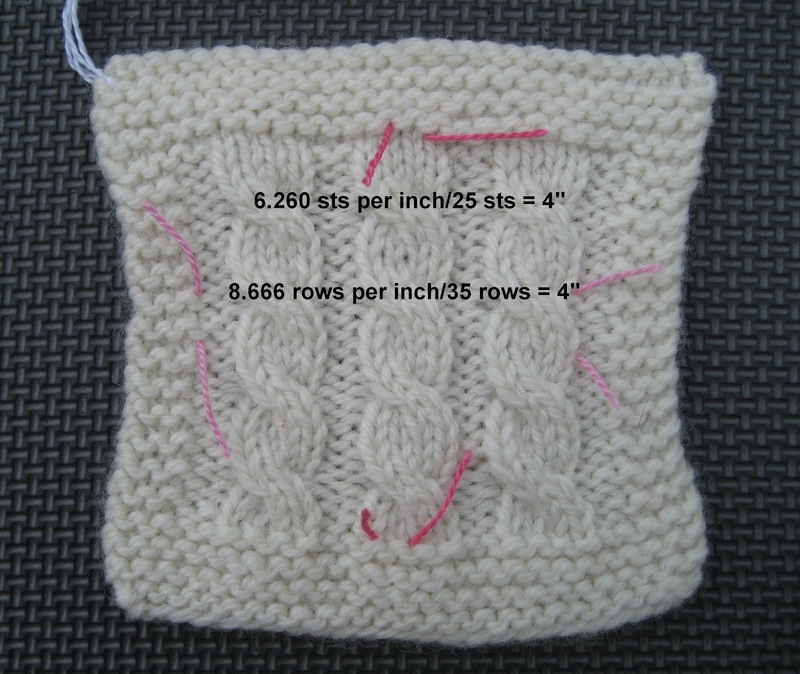 Once you have your measurements and stitch/row counts, you can do the final calculations. I am a math idiot and even I can do this. 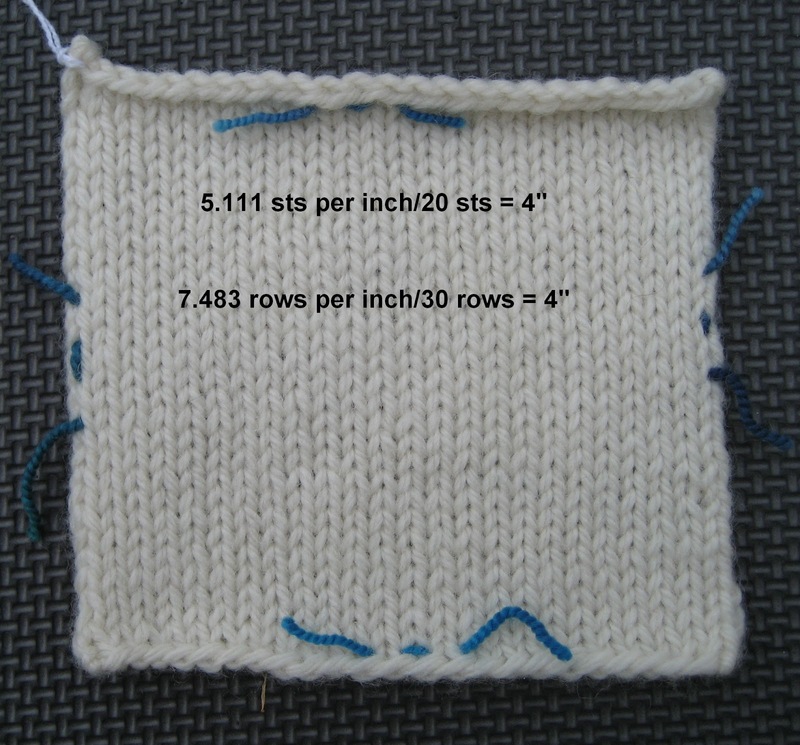 Stitch Gauge: Divide the number of stitches by the width. 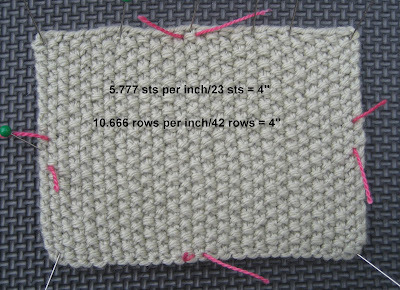 Using the Garter stitch example below, 23 stitches divided by the width of 4.125 is 5.575. This is the number of stitches per inch. How useful is this number? Not all that much unless you are designing or adapting a pattern. If you look at any pattern or at the ball band on a skein of yarn, it gives you the gauge for 4". 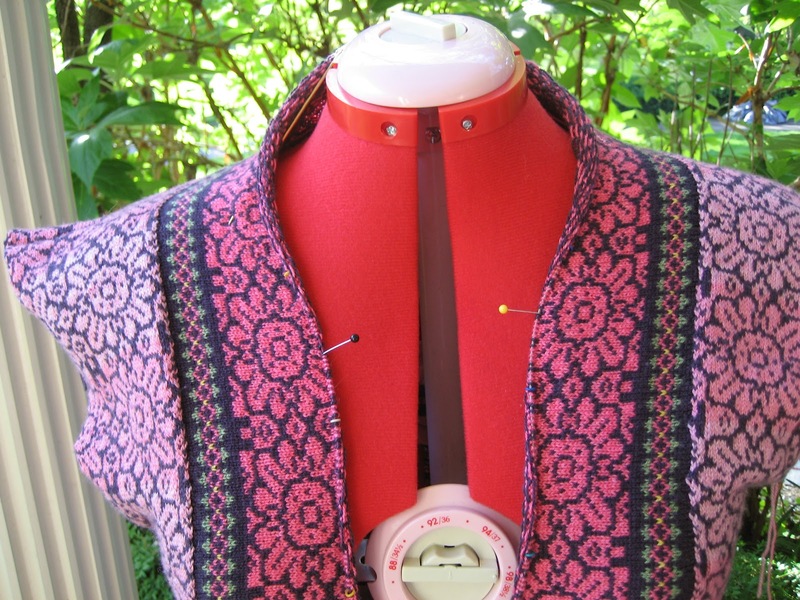 This is the "standard" (if anything is "standard" in the world of knitting). By the way, this is a totally random number. It could be anything. So if I want to compare my gauge to the expected gauge for the yarn or the gauge required for a pattern, I need to multiply my gauge per inch (5.575) by 4 to get a more useful figure. This gives me 22.303. Since I can't cast on .303 of a stitch, I round it down to 22. My stitch gauge over 4 inches is 22. Now have have something I can work with. Row Gauge: I repeat this for the row gauge. 32 rows divided by 2.875 is 11.130. 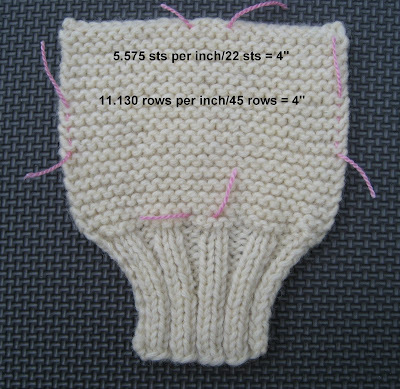 I multiply this by 4 to get 44.521 and since I can't knit .521 of a row, I round it up to 45. How important is row gauge? It depends on the stitch pattern you are working. If the pattern is stockinette or garter or some pattern where there is no row repeat, you can always knit fewer or more rows to get the length specified in a pattern. 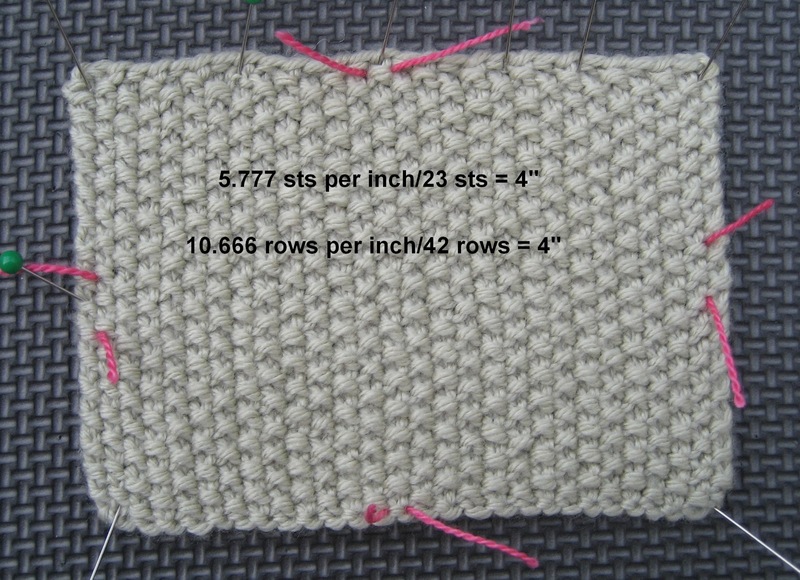 If the stitch pattern has a row repeat, row gauge is much more important. For many patterns, you just can't stop in the middle of a repeat. The stitch count might be wrong or it might look really unbalanced. 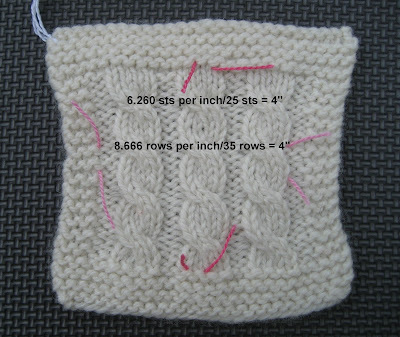 I've annotated the photographs of the stitch patterns I used for the marking and measuring tips with the final gauge. That is the problem with gauge. It isn't fun and exciting but it is SO important. A great many of the knitters taking my Basics class do so because they'd like their projects to fit. The solution to that problem is an understanding of gauge. As soon as I finish up the handouts for the finishing course I am going to start working on a correspondence course for gauge. 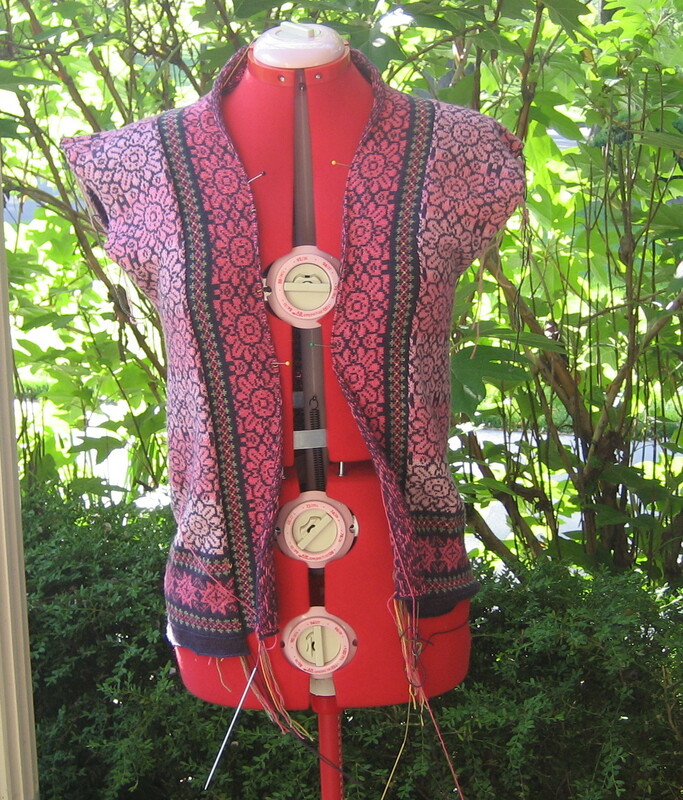 It will cover (among other topics) how to use gauge to alter patterns and how to use gauge to design garments. The opera last week was wonderful. I'd never seen Manon before and I wasn't familiar with the music but the French demi-monde always makes for great costumes and plots. The final simulcast is this Saturday. Another demi-monde story...La Traviata. It was the first live opera I saw and it made quite an impression. This should be a fantastic production. Violetta is sung by Natalie Dessay who actually looks like she could be dying of consumption. So Salon will be on Sunday like last week. I am so anxious to finish the Decoration Day jacket. 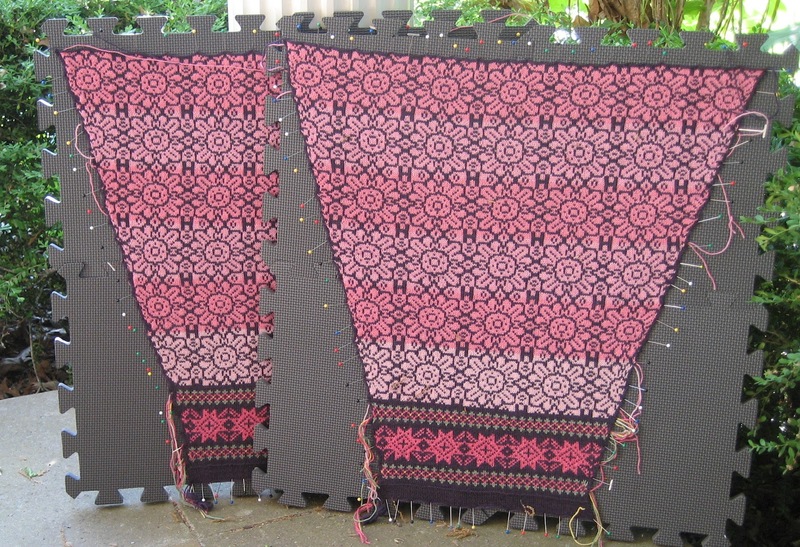 The sleeves are done and I am working on the front bands. They are taking FOREVER! This isn't surprising when I consider that I have over 600 stitches on the needles. I was dreading figuring out the pattern for the bands. I knew I wanted a the peony design with the borders from the bottom but I assumed I'd have to do some regraphing at the back of the neck. I couldn't believe it when after I'd cast on the stitches that I was only 2 stitches off from my 31 stitch repeat. No regraphing required. I hope that is the case for the other sizes! That would be nice. The front bands will have a facing but it will be in just one color. I hope to have it completely finished by mid week. We shall see. Oh my, your Decoration Day sweater is looking gorgeous. if I can be 1/2 as good as you someday I will be pleased as punch!